Optical fiber is a highly efficient transmission medium for light. Slightly thicker than a human hair, optical fiber is manufactured by drawing out transparent plastic or glass into long strands. It is flexible, capable of bending around obstacles and being fished through small wall cavities. Light travels along straight paths unless influenced by an outside force such as gravity (but not a magnetic field). Optical fiber can nevertheless conform to a curved path because of the straight light beam zig zags, reflecting from the interface between the fiber core and outer concentric cladding, which has a lower index of refraction. Light is confined to the core because of total internal reflection, so the fiber functions as a waveguide. Optical fiber is available in two varieties, multimode and single mode. They differ in radial dimensions, but they operate according to identical principles. Multimode optical fiber has a larger core diameter. It is used in runs of less than 1,000 ft., primarily for indoor work. It is exceptionally inexpensive compared to copper wire, and it is quick and easy to install, although some cautions are necessary. For example, if a quantity of optical fiber is spooled out onto the floor, workers and passersby must be prevented from stepping on it. The optical fiber must not be kinked or nicked. Splicing is exacting, because the core ends must be cut absolutely perpendicular to the run, polished, aligned, inspected and fused. However, in short spans, typically in indoor work, if the cable is damaged the entire run is generally replaced rather than repaired by means of a splice. Single-mode optical fiber is used in runs that are greater than 1,800 ft. It is far more exacting, especially in regard to splicing, and it is typically installed by heavily capitalized telecom subcontractors. At the inner core and outer cladding in optical fiber, total internal reflection takes place. Light traverses the fiber link, bouncing from side to side from the boundary between core and cladding. For the process to happen without loss, there must be zero leakage of light beyond the interface. Light must strike the boundary at an angle greater than what is known as the critical angle. This is a function of the refractive index of the two fiber optic layers. The range of permissible angles comprises the acceptance cone of the fiber. The sine of the critical angle required for light to propagate without leakage is the numerical aperture of the core. With a larger core diameter, there is greater attenuation, which is why multimode fiber will not propagate beyond a certain distance. Because it has a smaller core, single-mode fiber has less attenuation per linear foot and can propagate farther. However, the smaller core requires greater precision in spicing. For field work, single-mode installers employ a splicing van with elaborate equipment and a controlled environment. The process of joining multimode fiber segments is also more complex than splicing electrical wire. The fibers are prepared by precise cleaving and alignment. For permanent connections, a fusion splice is made, using an electric arc that melts the fibers. A lower-tech mechanical splice is often used, where the fiber ends are held together by physical force. Also, temporary or less critical connections are sometimes accomplished using optical fiber connectors. Fiber optics had its roots in the nineteenth century but did not become a viable communications medium until 1965, when attenuation was successfully reduced to below 20 dB/km. At that level, it is feasible to locate repeaters along the light path to boost the signal as needed. It was found that loss arose because of impurities in the fiber, rather than because of conceptual limitations. High-purity silica glass was right for the application. Doping the glass with titanium further enhanced the new medium. This technique evolved to substituting germanium dioxide as the primary dopant, dropping the attenuation to 4 dB/km. Soon individual fibers were being produced without splice in 25-mile segments. A light beam conveyed through optical fiber can be modulated to form pulses, logic high and logic low levels that carry digital information. The basic design goal is to build a system that will exhibit a high data rate over great distance. Nippon Telegraph and Telephone Corp. in the early decades of the 21st century repeatedly exceeded its own records, eventually transferring one petabit of data per second for 50 km. Optical fiber is widely used in telecommunications and computer networking because laser-generated light can traverse long distances with little attenuation. There is no electromagnetic interference transmitted or received. We think of optical fiber mostly as media for telecommunications and networking in short-haul and long-haul applications. But optical fiber is also well-suited for remote sensing. When modified, it can measure and convey data from a sensor that is designed to modulate intensity, phase, polarization or frequency of the light. The sensing element can be small in size so it can be integral with the fiber tip, constituting a device that can be inserted by means of a hypodermic needle into a human artery or vein. The circulatory system then provides access to otherwise inaccessible locations. One advantage is that electrical power is not needed at the site under investigation. Optical fiber is far less costly than copper electrical cable. But specialized tools and instrumentation that are used in some optical fiber systems diagnosis and repair require significant amortization. The advantage, however, is that they easily perform otherwise difficult tasks. An example is the optical time-domain reflectometer. It is used for detecting and analyzing the physical properties of an optical link. A related instrument is the electronic time domain reflectometer which locates faults along electrical communications media such as coax and category cable. Common faults in such transmission cables consist of impedance mismatches and physical damage to the conductors and/or shielding. When there is a fault in an electronic communications cable, a portion of the data reflects back toward the transmitter. This is harmful because the data bits collide, further garbling the data flow. A similar situation arises in an optical link except that rather than impedance mismatch and data collision, the phenomenon consists of attenuation and Raleigh backscattering that degrades the signal. The optical time domain reflectometer (typically available at Amazon for over $3,000) injects light rather than electrical pulses into the fiber link and extracts scattered light that reflects back. The instrument measures the strength of the return pulses and integrates them as a function of time. The bench model OTDR, much like an oscilloscope, has controls on the front panel and a screen that displays a trace of the signal that was returned to the instrument. A decisive issue in OTDR operation is duration of the measurement pulse and data sampling interval, which determine the instrument’s resolution. Better resolution accompanies short pulse duration, but this results in a shorter measurement range, so the tradeoff is something to consider in the context of anticipated usage. 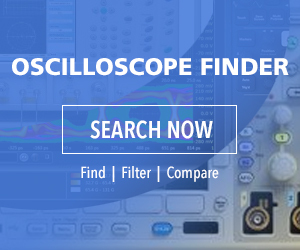 Moreover, if high-power reflections are received, the detector is temporarily overloaded and there is a phenomenon analogous to latency is an oscilloscope. Improved resolution can be achieved by means of a technique known as masking, whereby the detector is protected from powerful reflections. An optical time domain reflectometer. OTDRs are available as traditional bench-type instruments, hand-held OTDR and fiber break locators and remote fiber testing systems, which are built into the installation as rack-mounted instrumentation. The bench-mounted model has abundant measurement and analysis features and a large, clear display. The hand-held model offers portability and is branch-circuit independent. Lightweight and with a ruggedized enclosure, it is well-suited for the factory floor and outside work. A remote fiber test system can consist of decentralized components. It is usually networked to a computer in which proprietary software has been installed. Like a PC-based spectrum analyzer, it is a good candidate for maintenance and monitoring tasks because round-the-clock coverage and email notifications are standard features. The instrumentation may contain a database with historical documentation relating to connected systems.